Here at Eurostar, we try our very best to leave the lightest carbon footprint we can as we travel between London, Paris, Lille, Brussels and Amsterdam. And compared to air travel, we think we’re already pretty green. Read on to find out how a high-speed train stands up against a plane when it comes to CO2 emissions, and learn more about the sums behind our figures. The analysis of Eurostar versus air emissions has been based on an independent analysis by Paul Watkiss Associates Ltd. 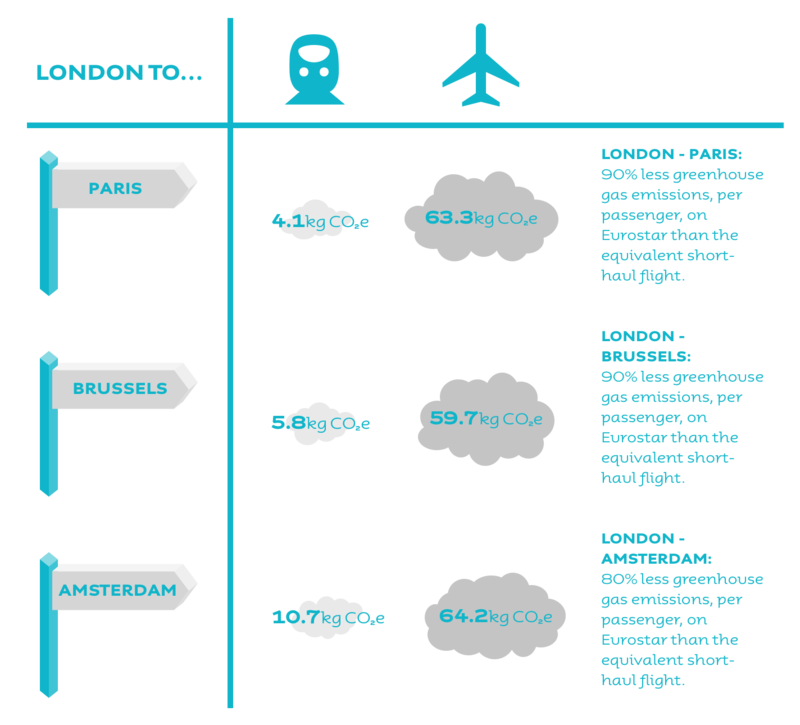 The comparison between Eurostar and aviation is made based on the kg of greenhouse gas emissions [CO2(e)] per train journey per passenger for an average single trip (based on the average of the outward and return journey). This allows a direct, accurate and fair analysis, i.e. a like for like comparison, as it takes account of the fact that rail journeys are typically longer (in km) than equivalent air journeys (so for rail, emissions per passenger journey are higher than emissions per passenger km, when compared to air). For the estimation of Eurostar emissions, energy use data (electricity consumption) from Eurostar trains (on scheduled services) has been measured using on-board meters. The additional electricity losses in the high voltage, rail transmission and distribution systems, i.e. from the power station to the train itself, are also included in the electricity consumption per journey. Load factors (passenger numbers) are based on the latest full year of reported passenger and train data. The analysis of emissions for Eurostar electricity consumption uses the Defra UK greenhouse gas reporting guidelines (https://www.gov.uk/guidance/measuring-and-reporting-environmental-impacts-guidance-for-businesses). This uses the recommended values from the average UK electricity mix. The values include all direct greenhouse gas emissions and indirect emissions (scope 3) including all upstream emissions (so called life cycle or well to wheel emissions). For the analysis of average electricity emissions in France, Belgium and the Netherlands, the analysis uses the IEA emissions from the Fuel Combustion online data service of the International Energy Agency (IEA) (this source is recommended in the Defra GHG guidelines). These data have been increased upwards to include all greenhouse gas emissions, to include transmission and distribution losses, and to include upstream emissions (scope 3), the latter using the Defra GHG Well-to-tank (WTT) conversion factors for overseas electricity. For aviation, emissions per journey were estimated using two methods. The first uses an aviation industry carbon emission calculator. The methodology applies the best publicly available industry data to account for various factors such as aircraft types, route specific data, passenger load factors and cargo carried. This data only includes CO2 emissions only it does not include the additional radiative forcing of aviation emissions at altitude. Note that the additional travel from centre to airport is not taken into account: the inclusion of these emissions would slightly increase the emissions for aviation, as airports are not located in urban centres. The second uses the Defra UK greenhouse gas reporting guidelines, which provide scope 3 (all GHG emissions) for aviation and also includes well to wheel emissions. The Defra GHG emissions presents emission factors with and without Radiative Forcing. Radiative forcing (RF) is a measure of the additional environmental impact of aviation: these include emissions of nitrous oxides and water vapour. Defra recommends that organisations should capture the influence of radiative forcing RF in air travel emissions. However, it also notes that there is very significant scientific uncertainty around the magnitude of the additional environmental impacts of aviation. The use of the Defra analysis with RF values leads to much higher emissions from air. In this analysis, we have used the aviation industry calculator, which excludes RF for the comparison with Eurostar, and produces lower emissions of greenhouse gas emissions from air journeys. These have been expressed again in kg of greenhouse gas emissions [CO2(e)] per journey per passenger to allow direct comparison with Eurostar.